The newest in my Weekday Lunch series, where I tell the tale of eating one meal a day on the job, and actually enjoying it. For all you weekday lunch enthusiasts, the wonderful ladies at BGSK have launched Brown Bag Week on their Small Kitchen College site. You can learn about great bag lunch ideas, and win some pretty awesome stuff from BuiltNY. Go check it out! See that photo up there? I shot that with my iphone, at work. It's a picture of yesterday's lunch, but it easily could have been a picture from any day this week. For the past little while, I've been bringing some version of this very easy salad for work every day, and it's pretty much made my summer. I think people assume that a brown bag lunch must be either a one-pot dish like pasta salad, or a wrap/sandwich. I'm of the opinion that almost anything can be brought to work for lunch (need proof? 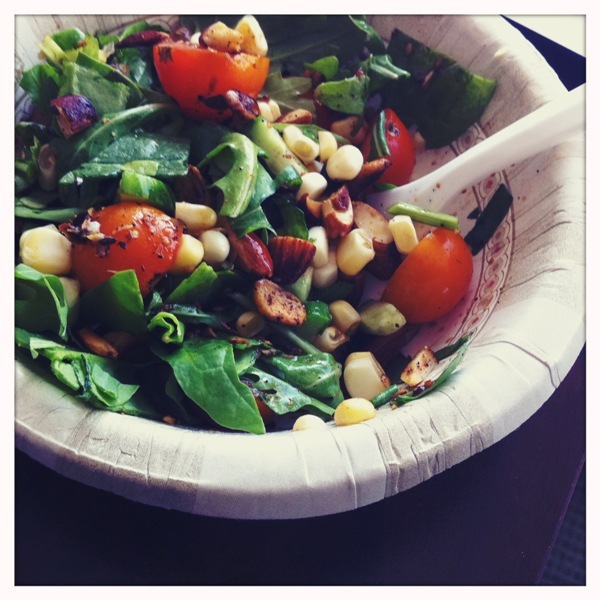 Check out my Weekday Lunch series), and salads are no exception. The key is to pack them smartly. Let's discuss. But first, what's in the dixie bowl? Well, we've got some of my favorite salad greens - a mix of spinach, arugula, and sorrel that I get at the market on Sundays - chopped; raw, bi-color corn kernels; halved cherry tomatoes; chopped cucumbers; and finally, the crowning ingredient, the thing that really makes this salad sing: crunchies. Every salad needs some crunch. Yes? Yes. It really can be anything: croutons, crisped up bits of cheese, nuts, you name it. For this salad, I used a mix of almonds, walnuts, pistachios, grated unsweetened coconut, and black currants for sweetness, but feel free to use whatever nuts, seeds, or bits suit your fancy (bonus points for already being in the larder, am I right?) 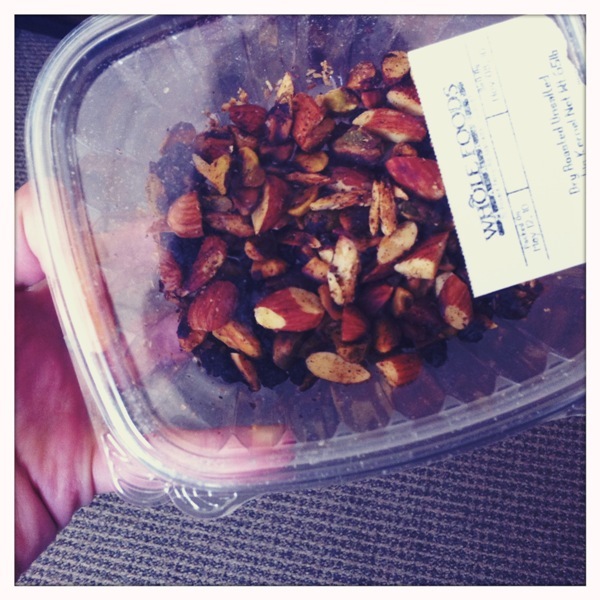 I've used sunflower seeds, pumpkin seeds, and even bread crumbs in the past. The goal is just to have something to crunch down on, something to give the salad textural contrast and an added layer of flavor. I've been toasting the crunchies in a non-stick pan with just a couple teaspoons of olive oil, some salt and pepper, and a bit of smoked paprika. (If you don't have smoked, regular will do.) Once they're nice and brown, I spread them on a sheet of foil to cool, then add the currants to the mix. Usually, I do this the night before. That way, I can grab my salad and the bag of crunchies and head off to work in no time. 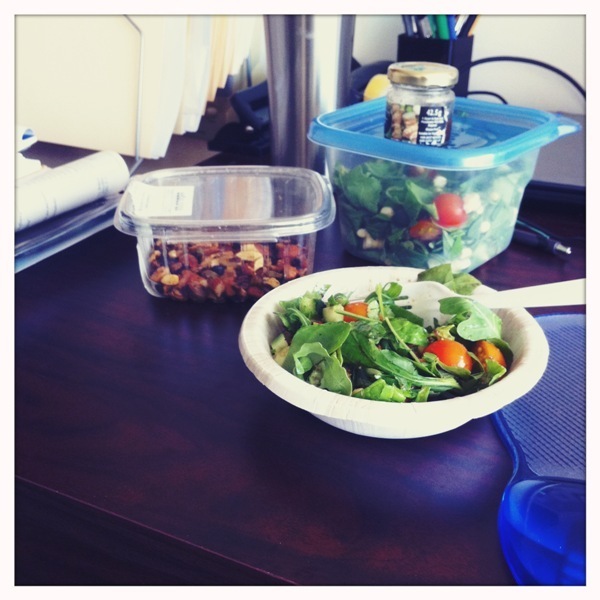 Back to the beginning for a moment: bringing salad for lunch is all about the packing method. I'm a stickler for tomatoes living outside the fridge, since chilling them really kills their flavor. If I'm bringing a salad without cheese, I'll store the whole thing outside the fridge until lunch, which, given the AC in my building, is totally 100% fine. If we've got cheese in there, I'll refrigerate it. But I never refrigerate the tomatoes. I bring them in a separate bag or container, which both prevents them from getting chilled with everything else, and prevents them from sogging up the rest of my salad. Crucial detail. Crunchies, of course, are also stored separately. At lunchtime, I add in the tomatoes, the crunchies, and some of the dressing (which I bring in a little recycled jam jar), toss, and eat. It's that simple. I get that some people find dressing to be a pain, so here's a tip: buy a bottle of olive oil and a salt shaker and store them at work. Bring half a lemon every day. There, you've got yourself easy vinaigrette. If you've got a totally different spread of vegetables at home, by all means, make this anyway. Swap cucs for zucs, arugula for romaine, carrots for tomatoes. Whatever works, whatever you like. Salad is a great brown-bag lunch: that's my story, and I'm stickin' to it. In a small nonstick pan, heat olive oil over medium heat. Add nuts, seeds, and bits, and toss to coat. Season with salt, pepper, and paprika. Cook, tossing or stirring occasionally, until nuts are evenly browned and smell fragrant, about 10 minutes. Remove from heat and let cool completely. If using currants, add to cooled mixture. Transfer to a storage container. Now, make the salad: Roughly chop salad greens. Dice cucumber. Remove kernels from corn cob. Halve cherry tomatoes. Combine greens, cucs, corn, and herbs in a large reusable container. Put tomatoes in a separate container or bag. Stick both in your lunch tote. Add those crunchies to your tote, too. If you're making dressing, pour that into a jar and bring it along. The eating part is probably self-explanatory.